A bipartisan group of lawmakers are pushing to allow the Veterans Affairs Department to conduct research into medical marijuana, saying it could help former military personnel suffering from post-traumatic stress disorder and chronic pain. The top lawmakers on the House Veterans Affairs Committee joined more than 30 colleagues in introducing the 2018 VA Medicinal Cannabis Act (H.R. 5520) on Tuesday. The introduction followed a pronouncement from the Trump administration that while VA was “committed to researching and developing ways to help” veterans cope with PTSD and chronic pain, federal law prevented it from engaging in any research—including referring patients to outside studies—involving medical marijuana. The measure would promote such research by clarifying it is “well within the authority of VA” and requiring the department to report to Congress on how it plans to exercise that authority. Lawmakers said they expected the bill would improve and save veterans’ lives. Members of both parties said they had heard from veterans who praised the benefits of medical cannabis, especially compared to the opioids they had been prescribed. Rep. Phil Roe, R-Tenn., chairman of the committee, said he too has heard from veterans who said they could benefit from medical marijuana and wanted further research. The American Legion, a congressionally chartered veterans service organization, has for two years called on VA to conduct research into medical marijuana and threw its weight behind the new bill on Tuesday. The group in 2017 conducted a survey of its 2.2 million members and found, with a 3.5 percent margin of error, that 92 percent of veteran households favor additional research into the medical benefits of cannabis. Sen. Jon Tester, D-Mont., the top Democrat on the Senate Veterans Affairs Committee, said he plans to introduce companion legislation in the upper chamber. “Veterans must have a say in how they manage their pain and the VA needs to listen to those veterans who are finding relief in medicinal cannabis,” Tester said. The Trump administration has shown some openness to medical marijuana, with the Veterans Health Administration issuing a directive late last year to allow its doctors to discuss their patients’ use and options regarding cannabis in states where it is legal. The department has previously faced criticism for preventing its medical staff from recommending patients to a state-funded research project that has the backing of several federal agencies and is examining the relationship between disorders affecting veterans and marijuana. Brad Burge, a spokesman for the Multidisciplinary Association for Psychedelic Studies, the organization conducting the study, said previous resistance from VA was based on “stigma, not law” and it was therefore unclear to what extent the bill would help MAPS’ research. The bill’s language to not just conduct but “support” cannabis research should, if the measure were passed, “make it resoundingly clear—even to the VA secretary—that there is nothing preventing VA from referring patients to independent federally regulated medical marijuana studies,” Burge said. Another bipartisan bill put forward this week aims to help VA recruit medical personnel to the department. The measure (H.R. 5521) would enable VA to recruit and initiate the hiring process for physicians two years prior to completing their requisite training. Such authority would put the department on equal footing with the private sector, said Rep. Vicky Hartzler, R-Mo., who authored the bill. The measure is the latest in a series of potential and actual reforms to help VA trim its backlog of more than 30,000 positions. The department this year received direct-hire authority for 15 occupations deemed critical, ranging from accountants to health technicians. Lawmakers have recently sounded the alarm on policies they say restrict VA from efficiently filling vacancies at its medical facilities around the country, but the department has pushed back on those claims. Still, VA just this week boasted that it has trimmed its central office workforce by 10 percent. Democrats in Congress have warned that such reductions make it harder for field offices to recruit and hire, as the central office provides key human resource functions. Hartzler said her bill, by boosting hiring efforts for internal medical positions, would also help allay concerns that VA is seeking to push more care to the private sector. 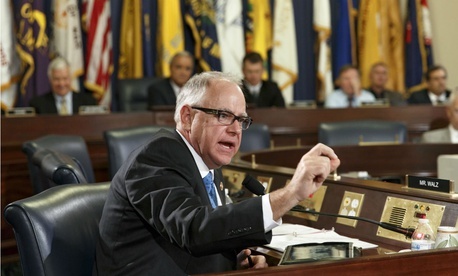 The American Legion, which has long fought against privatization efforts, endorsed her bill. VA has said it has no intention of privatizing veterans health care, and former Secretary David Shulkin worked closely with lawmakers in both parties and key stakeholders to forge an acceptable framework to consolidate and streamline VA’s various community care programs. Shulkin’s nominated replacement, Rear Adm. Ronny Jackson, has yet to take a public stance on the topic, but told Tester on Tuesday he would follow the path Shulkin paved.